The human immune system is poised to spring into action at the first sign of a foreign invader, but it often fails to eliminate tumors that arise from the body’s own cells. Orchestrating a successful immune attack against tumors has proven difficult so far, but a new study from MIT suggests that immune attack against tumors could be improved with cancer immunotherapy — simultaneously activating both arms of the immune system with antibodies (which activate the innate immune system) and stimulating T cells (which form the backbone of the adaptive immune system). Wittrup, an associate director of MIT’s Koch Institute for Integrative Cancer Research and also a faculty member in the Department of Biological Engineering, is the senior author of a paper describing the work this week in the journal Cancer Cell. Adoptive T cell therapy, on the other hand, enlists the body’s T cells to attack tumors. Billions of T cells flow through the average person’s bloodstream at any given time, each specialized to recognize different molecules. The weak point with T cells is that many tumor proteins do not provoke T cells to attack, so T cells must be removed from the patient and programmed to attack a specific tumor molecule. Instead of relying on that complicated process, Wittrup and his colleagues discovered that they could generate both types of immune responses — antibodies and T cells — while they were experimenting with improving antibody drug performance with a signaling molecule called IL-2, which helps boost immune responses. Wittrup and his colleagues overcame this by fusing IL-2 to part of an antibody molecule, which allows IL-2 to circulate in the bloodstream for much longer. In tests in mice with a very aggressive form of melanoma, the researchers found they could stop tumor growth by delivering this engineered form of IL-2, along with antibody drugs, once a week. 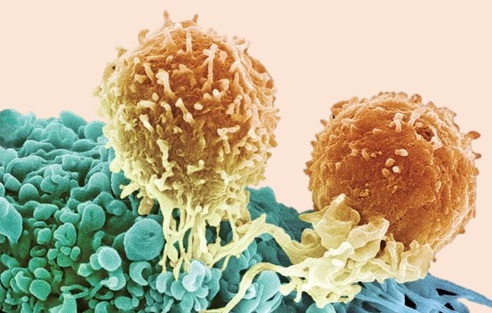 To their surprise, the researchers found that T cells were the most important component of the anti-tumor response induced by the antibody-IL-2 combination. They believe that the synergy of IL-2-induced cells and cytokines, along with the antibody treatment, creates an environment that lets T cells attack more effectively. The researchers are now exploring additional proteins that could be added to the IL-2-antibody combination to make immunotherapy more effective. In the meantime, simply giving patients more prolonged exposure to IL-2 could improve the effectiveness of existing antibody drugs, Wittrup says. 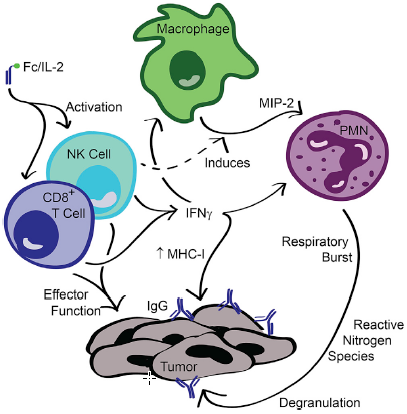 Cancer immunotherapies under development have generally focused on either stimulating T cell immunity or driving antibody-directed effector functions of the innate immune system such as antibody-dependent cell-mediated cytotoxicity (ADCC). We find that a combination of an anti-tumor antigen antibody and an untargeted IL-2 fusion protein with delayed systemic clearance induces significant tumor control in aggressive isogenic tumor models via a concerted innate and adaptive response involving neutrophils, NK cells, macrophages, and CD8+ T cells. This combination therapy induces an intratumoral “cytokine storm” and extensive lymphocyte infiltration. Adoptive transfer of anti-tumor T cells together with this combination therapy leads to robust cures of established tumors and development of immunological memory.